While CD remasters of great Broadway albums continue to be released in record numbers - nearly 30 Rodgers and Hammerstein albums were reissued in 1993, for example - the great art of making new cast recordings still flourishes. Since his arrival at Rodgers & Hammerstein, President and Executive Director Theodore S. Chapin has been involved in 21 R&H-related albums - from ON YOUR TOES (Polydor, 1983) and I REMEMBER MAMA (TER, 1985) to Philips Classics' 1992 recording of THE KING AND I with Julie Andrews. Earlier this spring Chapin attended recording sessions for the two newest R&H albums - Angel Records' 1994 Broadway cast recording of CAROUSEL and Varse Sarabande's Broadway cast recording of A GRAND NIGHT FOR SINGING - and shares these thoughts. I realized the other day that I got my introduction to musical theater through the sound track album of THE KING AND I. I remember the Christmas - 1956, I was 6 - and I remember the record player on which I played it (Victrola? Or is that just what my parents called it?). And although I may not have been introduced at the time to the dramatic intricacies of the art form, I certainly became hooked by the glorious music which poured forth from those round black discs made of something or other. In a few years I was old enough to be taken to live performances of musicals - at first, naturally, to shows whose scores I had come to know through records. I was surprised at the changes I found. There was dance music that wasn't on the album, reprises of songs I had never heard, and even whole overtures and entr'actes that were unfamiliar. At first I thought something was wrong, that mistakes had been made. Cast albums were "produced,"
I was told, and the producer whose name was so often at the bottom of the credits block on the front of the album was the person responsible for making the choices and creating something a little different - a retelling of the show, if you will, for a listening-only experience. A few more years passed, my soundtrack of THE KING AND I had been joined by a staggering number of other show albums, and I became hooked on the musical theater. When I saw a preview of COMPANY in 1970, I was so thrilled that I wanted to be around the show and those people in some fashion - so I asked if I could go to the recording session. Through the courtesy of Tom Shepard, the album producer, I was allowed to observe that extraordinary day (and can even be spotted, fleetingly, in D.W. Pennebaker's brilliant documentary on the making of the COMPANY album). I became a life-long fan of the particular grouping of talents and pressures that go into the creation of a cast album. Flash forward to 1994. Twice within three months this past spring I found myself in the control room of Clinton Studios in New York while two new Rodgers & Hammerstein cast albums were being recorded - first, CAROUSEL and then A GRAND NIGHT FOR SINGING. For CAROUSEL in April, the studio was filled with the 45-piece orchestra assembled for the soaring orchestral texture of the score under the masterful baton of Eric Stern. In June, the same space contained the six versatile musicians who make up Fred Wells' all-acoustic chamber combo for the first Rodgers & Hammerstein revue to play Broadway. Same space, same season, same composer, same lyricist - different personnel, different styles, different sounds. Both sessions held a common goal: to capture forever the essence of a theatrical event for the ears only. And believe me, the circumstances under which this is done are truly awesome. First, before the recording session begins, time is against you. Symphonic and operatic recordings may take several weeks to complete in comparatively plush surroundings around the world; pop albums are recorded over a period of months, sometimes in a series of studios. But cast albums are usually squeezed out in one highly-pressured, emotion-filled, eighteen-hour day. It is a grueling marathon of controlled chaos. The strict rules necessitate a juggling match of coordination. Rarely are songs recorded in show order, for example, which may mean musicians aren't needed for all the cuts, or some performers want to sing in the morning, while others prefer the evening, etc. At the center of the activity is the album producer, who not only has to decide what should be recorded, (including what cuts to be made, whether new transitions have to be created, which dance music to include, what dialogue, etc.) but also how the studio will be set up, where the instruments and performers will be placed and where the microphones (not to mention how many and which kind) are to be located. The recording engineer has the technical responsibilities to carry through the producer's wishes, including the manner of recording - "analog"" or "digital" - both of which have their passionate supporters. Then the fun comes. Despite all the pressures - or perhaps because of them - everyone has to come together and work like a team, pretending there is all the time in the world. But a kind of magic takes over when the producer says "The Carousel Waltz - take one," everyone becomes silent, and the music begins. Through the flubbed takes, the technical glitches, the frayed tempers, the arguments, everyone knows that something is being preserved for all time. Of course there are frustrations when a beautiful "take" is ruined by a trumpet mute clanging to the floor or when a singer screws up a lyric. But then there are moments when everything comes together, a glorious take is finished, there's the necessary moment of silence (to get a clean ending), and then everyone smiles and applauds. 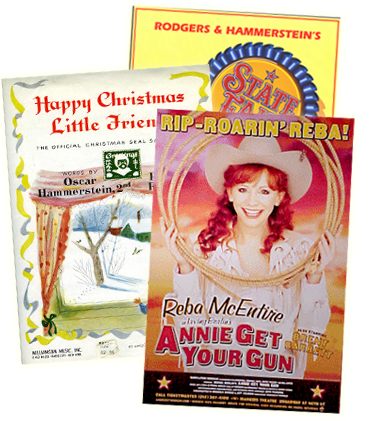 The history books tell us that Rodgers and Hammerstein started it all with OKLAHOMA! in 1943 - the first time that the cast and orchestra of a Broadway show were brought into a studio with the express purpose of capturing that show's score on record. With Jack Kapp at Decca and then with the legendary Goddard Lieberson at Columbia, Rodgers and Hammerstein helped establish the notion, and the need, for cast albums. They have inspired several generations of followers, (remember my dog-eared THE KING AND I soundtrack?) and it is my fervent wish that this season's crop of cast albums will inspire a few generations more.